Heavy sulfur isotopic compositions of arc lavas suggest a seawater component in the sulfur budget of arc lavas, but whether the seawater signature derives from the subducting slab or from magma interactions with lithologies in the upper plate is unclear. To see through the effects of degassing or crustal processing, a study was conducted on the S isotopic composition of deep arc cumulates from 45–90 km beneath the Sierra Nevada batholith in California, a Cretaceous continental arc. These cumulates represent the crystal line of descent from magmatic differentiation of hydrous arc basalts. The deepest (up to 60–90 km) and most primitive cumulates are low in Fe and have high molar Mg/(Mg + Fe), whereas the shallow and more evolved cumulates are high in Fe and have low Mg/(Mg + Fe). Bulk rock S correlates with Fe and negatively with Mg/(Mg + Fe). The most primitive cumulates are isotopically similar to the Earth’s mantle whereas the more evolved cumulates are heavier by 6‰ in the direction of seawater sulfate. The mantle-like S isotopic signatures of the primitive cumulates indicate that the contribution of slab-derived sulfate to arc lavas may not be as large as widely thought. Heavy S isotopic signatures are seen only in the evolved arc cumulates, which suggests that the seawater signature of arc lavas may not all derive directly from the slab, but perhaps during magma interaction with pre-arc crust. In continental arcs, pre-arc crust is dominated by accreted marine metasediments and metabasalts, and in island arcs, by seawater altered oceanic crust in the upper plate. The limited contribution of slab sulfate to the mantle source of Sierran arc magmas, if generalizable, suggests that sulfate in the subducting slab is efficiently released well before the arc magmatic front. Such a scenario would be consistent with the higher solubility of sulfate in aqueous fluids compared to that of sulfide. In summary, it is suggested here that the upper plate, in the form of seawater altered crust and sediments, may be as or more important for the sulfur budget in arc magmas than the subducting slab. Early loss of sulfate from the slab during subduction suggests that the dominant S species transported to the deep mantle is in the reduced form – sulfide. Subsurface fluid systems are important for chemical weathering, ore formation and thermal evolution of the crust. Changes in the dynamics and distribution of subsurface fluid flow systems are controlled by changes in global and regional terrestrial climate, tectonics, and elevation. 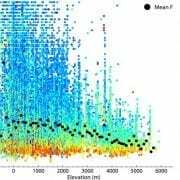 This paper concerns the dating of changes in ancient subsurface hydrologic systems. However, direct dating of water-rock interaction is challenging because of the lack of appropriate materials to date and the more open and complex nature of subsurface flow regimes. Here, we explore the prospects of using U-Pb dating of petrified (silicified) wood as a means of quantifying continental paleo-hydrology. Oxidizing fluids, often of meteoric origin, tend to leach and mobilize U from the country rock, but when such waters contact organic-rich material, U can become reduced and immobilized, resulting in U-rich silicified wood. We present in situ laser ablation ICPMS analyses of U-Pb isotopes and trace elements in petrified wood from the Upper Triassic Chinle Formation (225–208 Myr) in the Petrified Forest National Park in Arizona (USA), allowing us to establish a generalized workflow for making meaningful paleo-hydrologic interpretations of the U-Pb systematics of silicified wood. Wood characterized by brownish colors and preservation of cellular structure have low Fe contents and positive Ce anomalies, indicating silicification in reducing environments and isolation in relatively reduced conditions after silicification, resulting in closed system behavior of U and Pb. Wood characterized by vivid colors (orange, red, etc.) and little to no preservation of cellular structure are much higher in Fe and exhibit negative Ce anomalies, indicating influence by more oxidized fluids. The brownish samples yield U-Pb ages clustered between 250 and 200 Ma with a peak coinciding with the time of deposition (~220 Ma), which indicates that fossilization largely took place almost immediately after deposition and that U-Pb in quartz faithfully retains the time of such fossilization. In contrast, the orangish-reddish-whitish samples yield younger U-Pb ages, defining distinct errorchron ages, which reflect subsequent generations of quartz crystallization. Scatter associated with errorchrons are likely due to local (mm- to cm-scale) U or Pb mobility or variable initial Pb composition. Distinct younger age peaks appear to correlate with the timing of regional unconformities associated with tectonic or epeirogenic uplift. We suggest that uplift and exhumation may initiate the onset of oxidizing fluid systems, resulting in leaching and transport of U from the surroundings, followed by subsequent generations of quartz precipitation. In summary, U-Pb dating of petrified wood or silicified organic material, has high potential for dating paleo-hydrologic events. However, due to complexities in terrestrial hydrologic systems, interpretations of U-Pb systematics must be informed by accompanying geochemical and textural observations. The two most important magmatic differentiation series on Earth are the Fe-enriching tholeiitic series, which dominates the oceanic crust and island arcs, and the Fe-depleting calc-alkaline series, which dominates the continental crust and continental arcs. It is well known that calc-alkaline magmas are more oxidized when they erupt and are preferentially found in regions of thick crust, but why these quantities should be related remains unexplained. We use the redox-sensitive behavior of europium (Eu) in deep-seated, plagioclase-free arc cumulates to directly constrain the redox evolution of arc magmas at depth. Primitive arc cumulates have negative Eu anomalies, which, in the absence of plagioclase, can only be explained by Eu being partly reduced. We show that primitive arc magmas begin with low oxygen fugacities, similar to that of mid-ocean ridge basalts, but increase in oxygen fugacity by over two orders of magnitude during magmatic differentiation. This intracrustal oxidation is attended by Fe depletion coupled with fractionation of Fe-rich garnet. 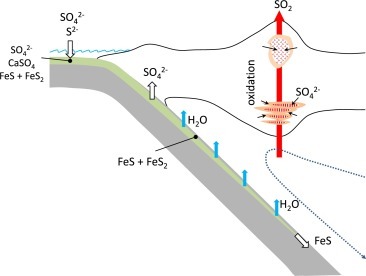 We conclude that garnet fractionation, owing to its preference for ferrous over ferric iron, results in simultaneous oxidation and Fe depletion of the magma. Favored at high pressure and water content, garnet fractionation explains the correlation between crustal thickness, oxygen fugacity, and the calc-alkaline character of arc magmas. On greater than million year timescales, carbon in the ocean-atmosphere-biosphere system is controlled by geologic inputs of CO2 through volcanic and metamorphic degassing. High atmospheric CO2 and warm climates in the Cretaceous have been attributed to enhanced volcanic emissions of CO2 through more rapid spreading at mid-ocean ridges and, in particular, to a global flare-up in continental arc volcanism. Here, we show that global flare-ups in continental arc magmatism also enhance the global flux of nutrients into the ocean through production of windblown ash. We show that up to 75% of Si, Fe and P is leached from windblown ash during and shortly after deposition, with soluble Si, Fe and P inputs from ash alone in the Cretaceous being higher than the combined input of dust and rivers today. Ash-derived nutrient inputs may have increased the efficiency of biological productivity and organic carbon preservation in the Cretaceous, possibly explaining why the carbon isotopic signature of Cretaceous seawater was high. Variations in volcanic activity, particularly continental arcs, have the potential of profoundly altering carbon cycling at the Earth’s surface by increasing inputs of CO2 and ash-borne nutrients, which together enhance biological productivity and burial of organic carbon, generating an abundance of hydrocarbon source rocks. The depth of slab dehydration is thought to be controlled by the thermal state of the downgoing slab: cold slabs are thought to mostly dehydrate beneath the arc front while warmer slabs should mostly dehydrate beneath the fore-arc. Cold subduction zone lavas are thus predicted to have interacted with greater extent of water-rich fluids released from the downgoing slab, and should thus display higher water content and be elevated in slab-fluid proxies (i.e., high Ba/Th, H2O/Ce, Rb/Th, etc.) compared to hot subduction zone lavas. Arc lavas, however, display similar slab-fluid signatures regardless of the thermal state of the slab, suggesting more complexity to volatile cycling in subduction zones. Here, we explore whether the serpentinized fore-arc mantle may be an important fluid reservoir in subduction zones and whether it can contribute to arc magma generation by being dragged down with the slab. Using simple mass balance and fluid dynamics calculations, we show that the dragged-down fore-arc mantle could provide enough water (∼7–78% of the total water injected at the trenches) to account for the water outfluxes released beneath the volcanic arc. Hence, we propose that the water captured by arc magmas may not all derive directly from the slab, but a significant component may be indirectly slab-derived via dehydration of dragged-down fore-arc serpentinites. Fore-arc serpentinite dehydration, if universal, could be a process that explains the similar geochemical fingerprint (i.e., in slab fluid proxies) of arc magmas. 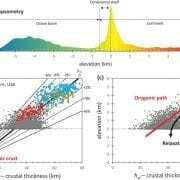 Elevations on Earth are dominantly controlled by crustal buoyancy, primarily through variations in crustal thickness: continents ride higher than ocean basins because they are underlain by thicker crust. Mountain building, where crust is magmatically or tectonically thickened, is thus key to making continents. However, most of the continents have long passed their mountain building origins, having since subsided back to near sea level. The elevations of the old, stable continents are lower than that expected for their crustal thicknesses, requiring a subcrustal component of negative buoyancy that develops after mountain building. While initial subsidence is driven by crustal erosion, thermal relaxation through growth of a cold thermal boundary layer provides the negative buoyancy that causes continents to subside further. The maximum thickness of this thermal boundary layer is controlled by the thickness of a chemically and rheologically distinct continental mantle root, formed during large-scale mantle melting billions of years ago. The final resting elevation of a stabilized continent is controlled by the thickness of this thermal boundary layer and the temperature of the Earth’s mantle, such that continents ride higher in a cooler mantle and lower in a hot mantle. Constrained by the thermal history of the Earth, continents are predicted to have been mostly below sea level for most of Earth’s history, with areas of land being confined to narrow strips of active mountain building. Large-scale emergence of stable continents occurred late in Earth’s history (Neoproterozoic) over a 100–300 million year transition, irreversibly altering the surface of the Earth in terms of weathering, climate, biogeochemical cycling and the evolution of life. Climate during the transition would be expected to be unstable, swinging back and forth between icehouse and greenhouse states as higher order fluctuations in mantle dynamics would cause the Earth to fluctuate rapidly between water and terrestrial worlds. Long-standing debates exist over the timing and mechanism of uplift of the Tibetan Plateau and, more specifically, over the connection between lithospheric evolution and surface expressions of plateau uplift and volcanism. Here we show a T-shaped high wave speed structure in our new tomographic model beneath South-Central Tibet, interpreted as an upper-mantle remnant from earlier lithospheric foundering. Its spatial correlation with ultrapotassic and adakitic magmatism supports the hypothesis of convective removal of thickened Tibetan lithosphere causing major uplift of Southern Tibet during the Oligocene. Lithospheric foundering induces an asthenospheric drag force, which drives continued underthrusting of the Indian continental lithosphere and shortening and thickening of the Northern Tibetan lithosphere. Surface uplift of Northern Tibet is subject to more recent asthenospheric upwelling and thermal erosion of thickened lithosphere, which is spatially consistent with recent potassic volcanism and an imaged narrow low wave speed zone in the uppermost mantle. Continental magmatic arcs are characterized by voluminous flare-ups accompanied by rapid arc unroofing and sedimentation in the forearc basin. Such magmatism and erosion may be dynamically linked and influence the long-term evolution of crustal thickness. To evaluate these effects, we conducted a case study in the Peninsular Ranges batholith (PRB) in southern California, where mid-Late Cretaceous (125-75 Ma) emplacement of felsic plutons coincided with a major pulse of arc-derived sediments into the adjacent forearc basin. We compiled zircon U-Pb ages in the PRB plutons and estimated magmatic addition rates from exposed areas of plutons with different ages. To obtain erosion rates, sandstone samples of known depositional age from the PRB forearc basin were investigated. Major element compositions of detrital hornblendes were determined by electron probe microanalysis and used to calculate emplacement depths of eroded plutons using Al-in-hornblende barometry. These results were combined with laser ablation ICPMS based U-Pb ages of accompanying detrital zircons to estimate the integrated erosion rate by dividing the detrital hornblende emplacement depth by the lag time between peak detrital zircon age and depositional age. Both magmatic addition and erosion rates are between 0.1-2 km/Myr. Magmatic addition peaked at 100-90 Ma, followed by a long, protracted period of erosion between 90-50 Ma. Mass balance and isostatic modeling suggests that due to high magmatic influx, more than 30 km integrated crustal growth and 5 km elevation increase was achieved shortly after peak magmatism. The data and models suggest that erosion was driven by magma-induced crustal thickening and subsequent surface uplift, with an erosional response time of 3-6 Myr. Prolonged erosion after the cessation of magmatism resulted in gradual smoothing of the topography and significant removal of the excess crustal thickness by late Eocene time. The short erosional response times inferred from this study suggest that erosion and magmatism are intimately linked, begging the question of whether the thermal state, metamorphism and rheology of crust in continental arcs is controlled in part by the interplay between erosion and magmatism. We speculate that syn-magmatic erosion, through its effects on the thermal structure of the crust, may also play a role in modulating the depth of pluton emplacement. 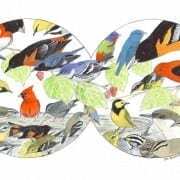 What to expect: peak of bird migration, thousands of shorebirds, hundreds of colorful songbirds, and lunch on a salt dome rimmed by oil wells! What to bring: binoculars (if you have them, but not absolutely necessary), hat, sunscreen, water, lunch, full gas tank, friends. All are welcome. No experience necessary. From Houston, take I-10 east. Get off on EXIST 812 (TX-61/Hankamer/Anahuac). Turn right (south) on TX-61, which will eventually become FM 562. At the Y intersection, turn left onto Whites Ranch Rd (FM1985). From the T intersection, continue for about 3 miles to Anahuac NWR sign on your right. Turn right and go south for 2.5 miles to nature store. We will do the Shoveler Pond loop and look for various waterbirds. From Anahuac, return to FM 1985 and turn right (east). Continue until you reach TX 124. Turn right (south) to High Island. Cross intracoastal canal and then veer left on Weeks Road to the church. The First Baptist Church holds a BBQ every Saturday of April. Those of us who want to eat BBQ can eat there, others can bring their own lunches. We will picnic outside of the church. From the church, continue south on Weeks Rd. Turn right on 7th and then an immediate left on Dunman. At the intersection of Dunman and 5th, there is a parking lot. Park here and walk to Boy Scout woods (handicap parking after turning left on 5th). Retrace route to Weeks Rd, but instead of going back to the church, turn right on Old Mexico Road until you reach Smith Oaks headquarters. Contact Cin-Ty Lee or Martha Lou Broussard for more details, ride-sharing, etc. Please let us know if you are coming so that we don’t leave anyone behind at the meeting spot.